The second series of past Doctors meeting new series enemies is, to put it mildly, worth every second of your time and the entry fee. 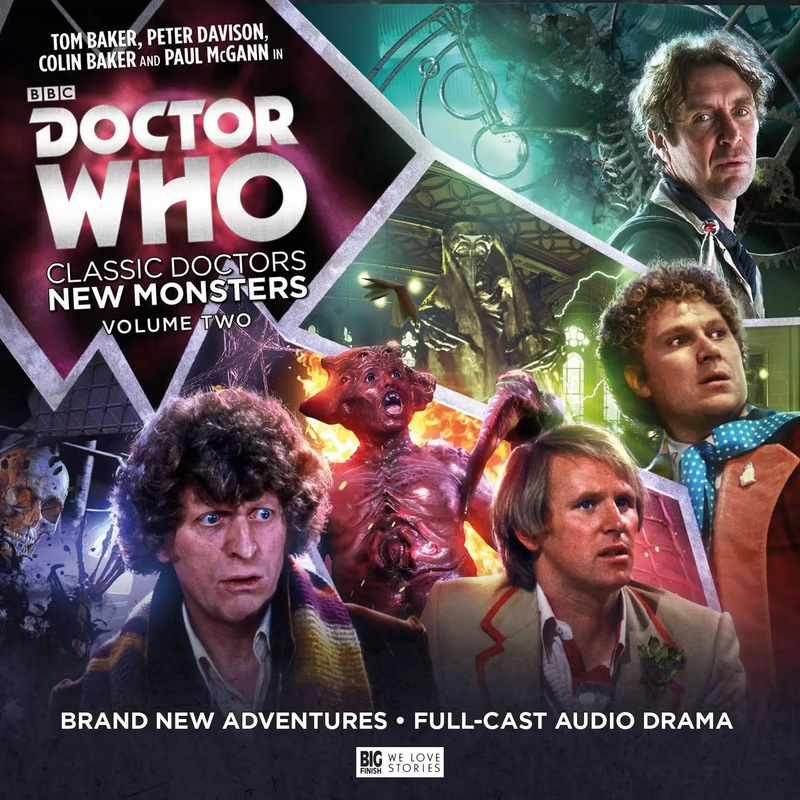 We are, of course, talking about Classic Doctors, New Monsters: Volume 2, which sees Tom Baker, Peter Davison, Colin Baker, and Paul McGann’s respective incarnations of the Doctor come up against threats from the 2005- present era of Doctor Who. Or more specifically, from 2006- 08. There’s a risk with these kind of stories, where the meat of the tale can get lost in an advertising gimmick: “Look! The Fifth Doctor against that monster you saw on telly during the Tenth Doctor’s era!” Thankfully, there’s as much care and depth put into series two as their was in series one. This is some of the most fun that Doctor Who has had recently, and the glory of that blazes through in these separate stories. We span great big handfuls of the Doctor’s travels and epochs: the Fifth Doctor gets caught in a war set a very long time ago between the Time Lords and the Racnoss in Empire of the Racnoss by Scott Handcock; the Sixth Doctor runs afoul of a group of Carrionites in a battle of words in the British Midlands (for The Carrionite Curse by Simon Guerrier); and the Fourth and Eighth Doctors begin and end the set as their experiences fighting the Vashta Nerada are relayed for Night of the Vashta Nerada by John Dorney and Day of the Vashta Nerada by Matt Fitton. Old Sixie using his verbose vocabulary is so perfect for his story that deals with language, it’s slightly spooky how well his adventure gels. The Fifth Doctor carries the gravitas that comes with the darker recesses of Gallifrey’s dangerous past, instilling the pragmatic heroism in himself that appears very much five (or six, depending on how you’re counting) incarnations later. His story helps to broaden the impact when watching The Runaway Bride (2006). Night of the Vashta Nerda is every bit as enjoyable as one could imagine. 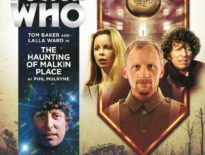 The Fourth Doctor running from deadly shadows is a worthy adventure to listen to – Baker flies when against this seemingly unstoppable foe and manages to show a more vulnerable side to his Doctor, events seeming to pierce his usually strong amour. It’s incredibly hard to pick a favorite from this bunch but perhaps Day of the Vashta Nerada just pips the rest to the post. It’s everything that you would want from a mix of classic and new Doctor Who. 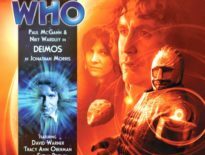 It’s set around the Time War conflict, it has the wicked Cardinal Ollistra (Jacqueline Pearce), there’s a new breed of Vashta Nerada, and most importantly, it showcase just how much energy McGann pours into his performance. This hour-long adventure flies by, partly down to good writing and direction of course, but largely down to a stellar performance from the Eighth Doctor. At times, this really feels as if this was a television episode, but for some reason iPlayer was down and the audio is all that’s left. From beginning to end, the excitement in Day of the Vashta Nerada is palpable. Go forth and enjoy it. Just make sure there aren’t any shadows around you. Big Finish have really nailed what it means to mix old with new in the box set, taking qualities from both of Doctor Who‘s main era and merging them together for essentially four hours of fun. Classic Doctors, New Monsters: Volume 2 is out now from Big Finish, priced £35 on CD or £30 as a download.